The issue of US pre-clearance in Irish airports is under intense scrutiny following the travel ban. MINISTER FOR CHILDREN, Katherine Zappone, has said that the legality of applying the new US travel ban in Irish airports needs to be urgently questioned. Speaking on Newstalk Breakfast, the American-born TD said that for people who voted against Trump, his latest move meant that their “worst fears have been realised”. Richard Bruton, speaking later to RTÉ, said that Trump’s actions were “alarming”, and that all of the issues would be discussed at cabinet tomorrow. Shortly after British prime minister Theresa May held talks with Trump at the White House on Friday, the new president signed an executive order to suspend refugee arrivals and impose tough new controls on travellers from seven Muslim countries. Zappone said that the question of Irish authorities adhering to this ban and apply it to travellers attempting to travel from Irish soil was of primary importance. “I’m calling into question whether the Irish government is required to implement policies of discrimination,” she said. Our pre clearance immigration agreement with US does not undermine rights contained in Irish Constitution....legal review urgently needed. 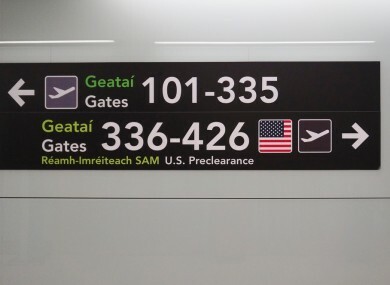 Ireland is one of only a few countries that offers US customs and clearing checks before taking off, meaning that arrivals from Irish airports are treated as domestic arrivals when they reach the US. Speaking on RTÉ’s Morning Ireland, Independent TD Kevin “Boxer” Moran echoed Zappone’s sentiments. Also speaking on Morning Ireland, Professor of Global Legal Studies at Birmingham Law School Fiona de Londras said that Irish law applies in Irish airports, despite the US pre clearance checks that take place. She added that Irish law, and not American law, applied in these pre-clearance areas in Dublin and Shannon airports. On RTÉ’s News at One, Minister for Education Richard Bruton did not give a solid indication on the government’s stance on whether people could be stopped under this US directive at Irish airports. He did say that the issue would be debated at cabinet tomorrow. In a statement issued today by a group of human rights bodies, including Amnesty International, the Immigrant Council of Ireland and the Irish Refugee Council, they express concern that Irish officials will assist US pre-clearance officials implementing the ban. They issue a call for the Minister for Foreign Affairs and the Minister for Justice to immediately conduct a review of the pre-clearance system in Ireland and consider suspending the pre-clearance agreement if a person’s right under the constitution may be under threat. They also demand clarification on the role of gardaí and immigration officials in the US pre-clearance process to ensure that, in the exercise of their duties, they do not violate a person’s rights under Irish, EU and international law. Earlier today, MEP Brian Hayes signed a motion in the European parliament opposing the travel ban, becoming the latest Irish politician to have their say on the issue. A protest is also due to be held by the Green Party at the US Embassy in Ballsbridge today at 5pm. While it had initially appeared that travellers from the UK would be exempt from this ban, a statement issued today by the US embassy in London appeared to suggest that visa issuance had been cancelled, even for those with dual nationality. Foreign Secretary Boris Johnson had previously indicated that the ban would not apply to UK nationals but, according to the US embassy, this does not appear to be the case. Email “Focus intensifies on how Ireland should deal with Trump's travel ban”. Feedback on “Focus intensifies on how Ireland should deal with Trump's travel ban”.